The Avoca project is centred on mesothermal quartz vein hosted gold and related placer-style ‘deep lead’ gold mineralisation. There is a considerable local history of mining both kinds of deposit. The term ‘deep lead’ refers to buried auriferous river bed deposits. Currawong has also identified an opportunity to reprocess a number of historical mine dumps located within EL5387 to recover gold, with potential for the sale of by-products (gravel and sand) as construction material. 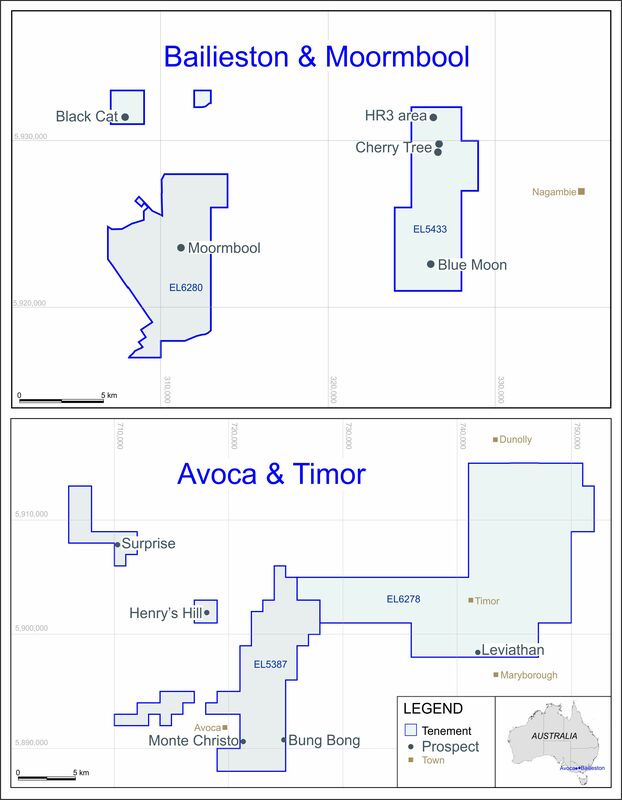 On the basis of this concept, Currawong has conducted preliminary economic studies in relation to certain historical dumps at Avoca, reprocessing of which may have the potential to generate relatively near term revenue (12-24 months from today) with relatively low capital costs (less than AUD 1M). The aforementioned timescale and capital cost estimate are subject to confirmation, but are derived from the results of prior studies by Currawong. These studies are preliminary, and further work will be required to provide conclusive results. Currawong has estimated mineral resources in respect of a number of dumps located up to 1km apart. As yet, these resources do not comply with any Standard, as that term is defined by the AIM Note for Mining and Oil & Gas Companies, and are therefore not being disclosed.